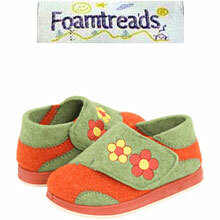 The Foamtreads name has been synonymous with quality, comfort and value for over a half century. Make Foamtreads children’s slippers a part of your child’s daily routine and they will find their feet to be relaxed and rejuvenated. Their shock absorbing, flexible, indoor/outdoor soles make them an incredibly versatile slipper at a great price.